Dear fashion and music lovers, I wish you a great Thursday morning with the great Ariana Grande. When rapper Mac Miller tragically died of a suspected overdose on Friday, Ariane Grande’s name was immediately trending on Twitter and other social media. Instead of blaming her on the death of her ex boyfriend like others, I’d like to write about her story. Ariana Grande-Butera (born June 26, 1993) is an American singer and actress. She began her career in 2008 in the Broadway musical 13, before playing the role of Cat Valentine in the Nickelodeon television series Victorious (2010–2013) and in the spinoff Sam & Cat (2013–2014). She has also appeared in other theatre and television roles and has lent her voice to animated television and films. Grande’s music career began in 2011 with the soundtrack Music from Victorious. In 2013, she released her first studio album Yours Truly, which entered atop the US Billboard 200. The album’s lead single, “The Way“, debuted in the top 10 of the Billboard Hot 100, with critics comparing her wide vocal range to that of Mariah Carey. Grande’s second studio album, My Everything (2014), entered at number one in the US and charted in the top 10 in 24 other countries. With the lead single “Problem” and several other singles, she was continuously in the top 10 of the Billboard Hot 100 for 34 weeks and had the most top 10 singles of any artist in 2014. The next year, Grande gave her first world tour, The Honeymoon Tour, to promote My Everything. In 2016, she released her third studio album Dangerous Woman, which charted at number two on the Billboard 200. Its title track debuted at number 10 on the Billboard Hot 100, making Grande the first person in the history of that chart to have the lead singles from each of their first three albums debut within the top 10 in the US. In 2017, Grande gave her international Dangerous Woman Tour. 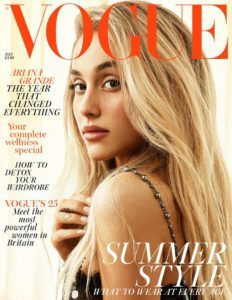 She released her fourth studio album, Sweetener, in August 2018. The album debuted at number one on the Billboard 200 and in a number of foreign markets. As of June 2018, Grande’s music videos had been viewed a total of more than ten billion times online. Her accolades include three American Music Awards, three MTV Europe Music Awards, two MTV Video Music Awards and four Grammy Award nominations. Grande has sold 30.5 million digital singles in the US. All three of her albums have been certified platinum by the RIAA. She has supported a range of charities and has a large following on social media. In 2016, Time named Grande one of the 100 most influential people in the world on their annual list. The bonus track of today is “Breathin” from her new album “Sweetener”. I wish you a successful Thursday and come back very soon with a new story.